Apart from Matt and the kids, my reading life is what saves me over and over again. I picked up The English Patient from our bookshelves a few weeks ago, initially pulled in 100% by the cover of Ralph Fiennes making out with Kristin Scott Thomas. 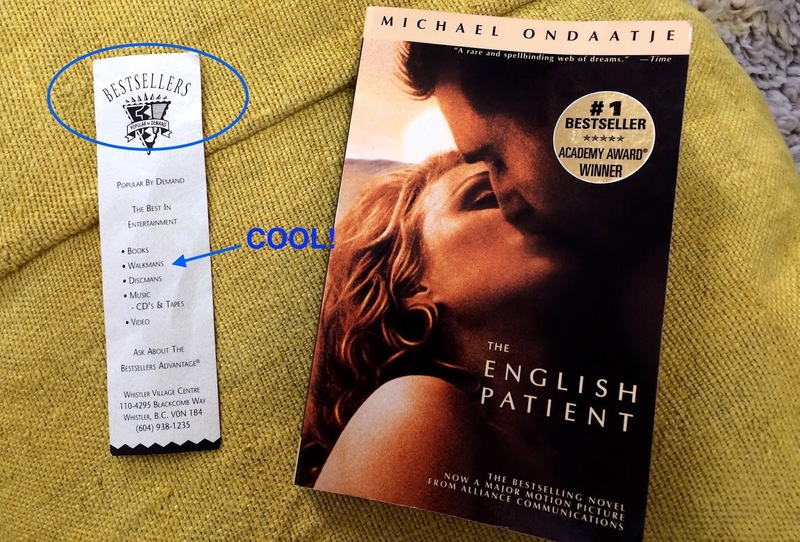 It also helped that tucked inside the book I found a bookmark from a bookstore in Whistler, British Columbia called Bestsellers. According to this bookmark, the following are some of the things that you can be sure to find at Bestsellers: "Books, Walkmans, Discmans, Music (CDs & Tapes), Video." I've sadly never been to British Columbia, so Matt and I have decided that his mom or dad must've bought the book while there on a ski trip, sometime in 1996 or 1997. I saw the movie a million years ago and didn't remember much about the plot. I remembered the Ralph Fiennes character had gotten badly burned, of course (but that pre-burn he had made out with Kristin Scott Thomas). I also remembered that something bad had happened to the Willem Dafoe character. It was Ondaatje's prose that pulled me in from the very first page. Here's a moment from early on that I'm still thinking about, "Coming out of what had happened to her during the war, she drew her own few rules to herself. She would not be ordered again or carry out duties for the greater good. She would care only for the burned patient." Gaaahhh. What a treasure of a book! As for the kitchen and cooking, lately I've not been super inspired. But this salad is delicious and easy to make. And if you served it with with some basmati rice and a fried egg (and maybe some greek yogurt on the side), it would be a dinner worth telling people about. In a liquid measuring container or small bowl, stir together the tahini, boiling water, olive oil, honey, and lemon juice. Season to taste with salt. Put the carrots and radishes in a large bowl, add the dressing and toss to combine. Use a spoon to scoop the avocado from its skin and place the pieces over the carrots. Season the avocado with a bit of salt. Scatter the salad with the sesame seeds, scallions, and parsley (if using). Serve immediately. Did Isaac eat more? Of course I have never seen him turn down anything.